I have always been in awe of crafters that have successfully completed DIY’s that involved gold, copper or silver leaf. I have seen projects were these super thin sheets of metal have been added to mirrors, frames, and even furniture. But somehow I imagined myself doing this and ending up with sheets of gold leaf stuck everywhere but on my project. 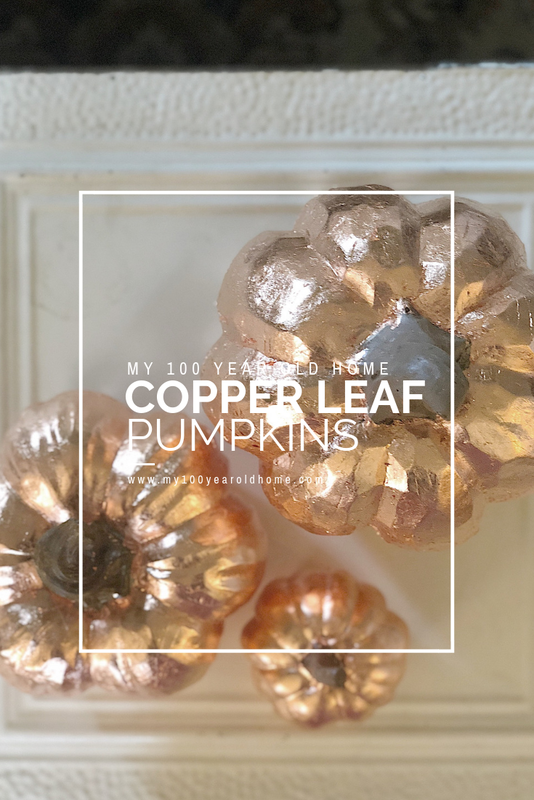 Lately, I have been on an orange and copper craze and I have wanted to try my luck at pumpkin crafts. 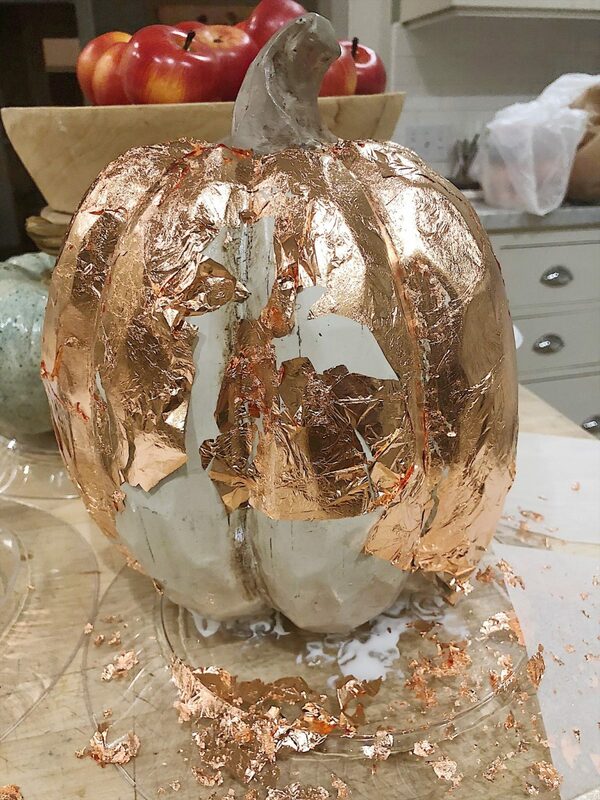 So I decided to make copper leaf pumpkins. 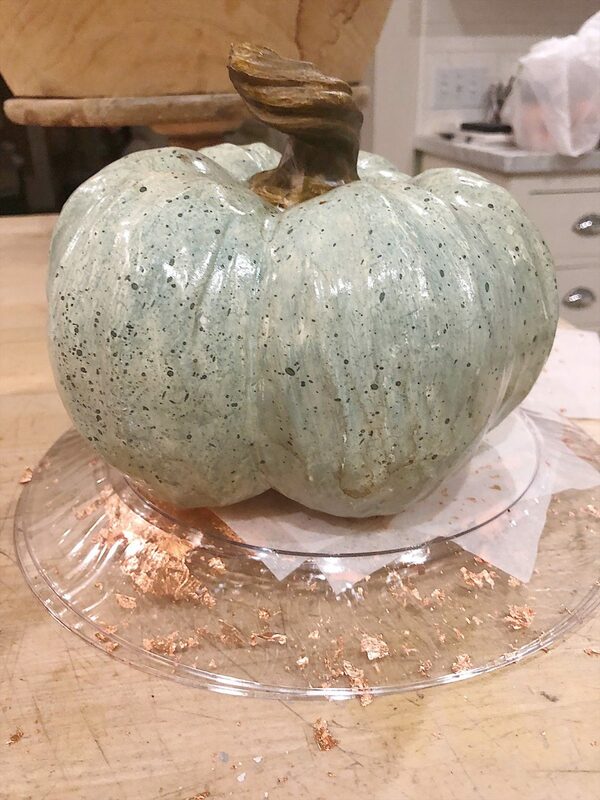 Can I just say this is one of my absolute favorite pumpkin craft DIY’s ever? I assumed the copper leaf would be expensive. But I found imitation rose gold sheets for crafting on Amazon and purchased 100 sheets for under eight dollars! I was able to finish all three of these pumpkins using less than 100 sheets. The color is perfect as rose gold and copper appear to be the same color! 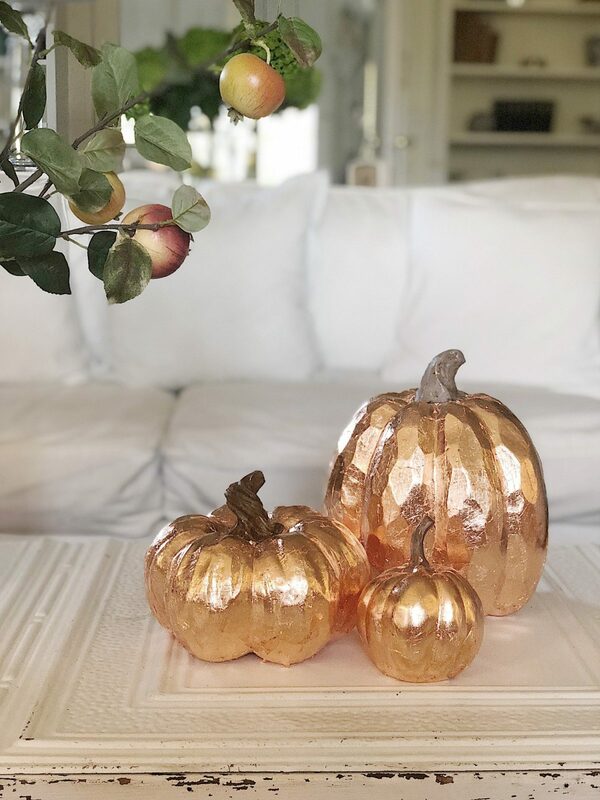 I thought about using real pumpkins but decided I didn’t want to go to the trouble of making these copper leaf pumpkins if they weren’t going to last. 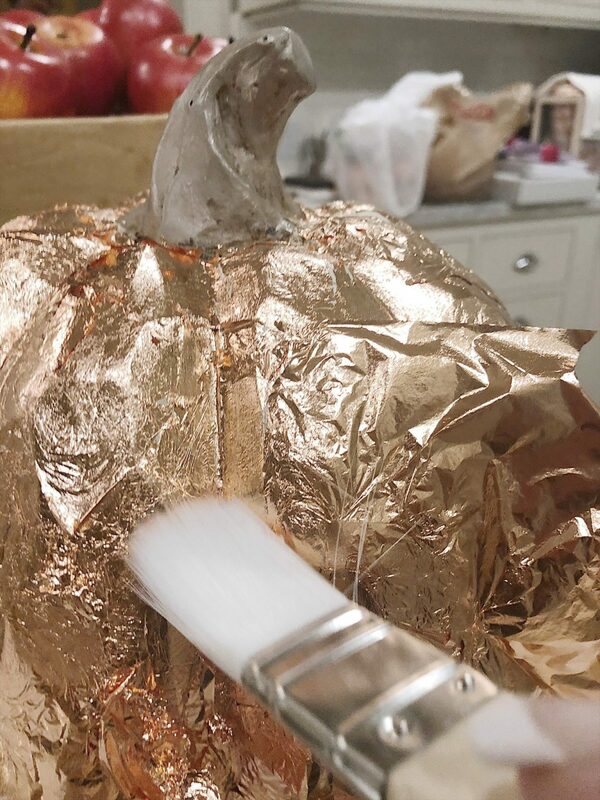 Use a paintbrush to thinly cover the pumpkins with the adhesive. Be sure to place your pumpkins on a plastic type surface that won’t stick to the pumpkin. 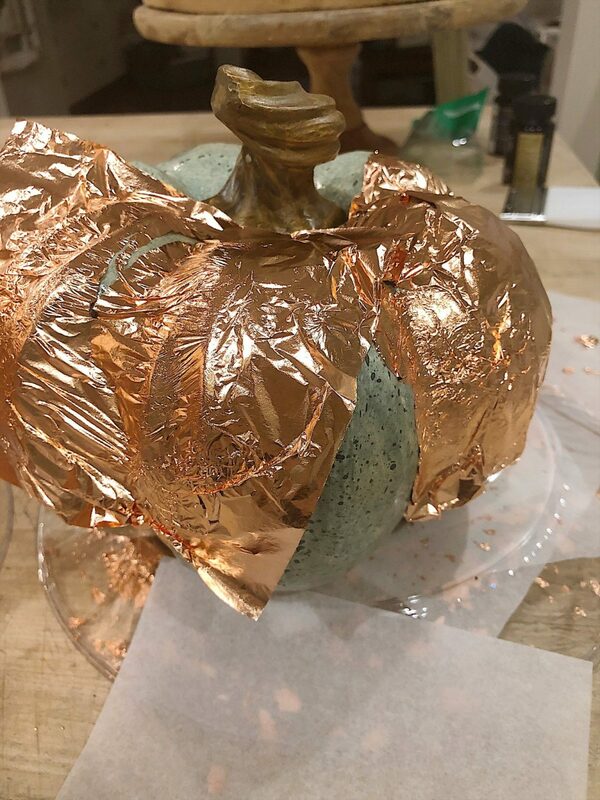 Try to cover all surfaces of the pumpkin with the adhesive. Let the adhesive dry for thirty minutes. 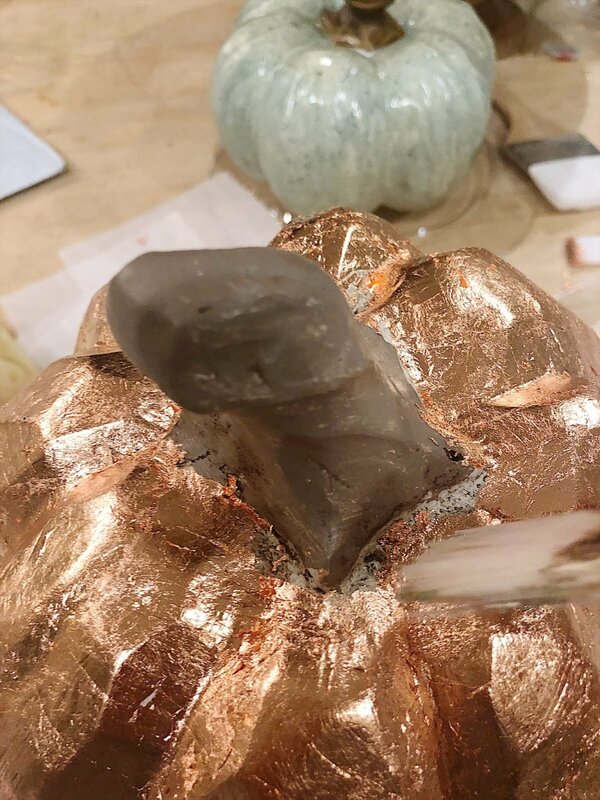 Gently lay a piece of the copper metal leaf on the pumpkin. Continue to cover with as many sheets as necessary. Don’t worry about spots that are missed as you will come back and add more copper later. 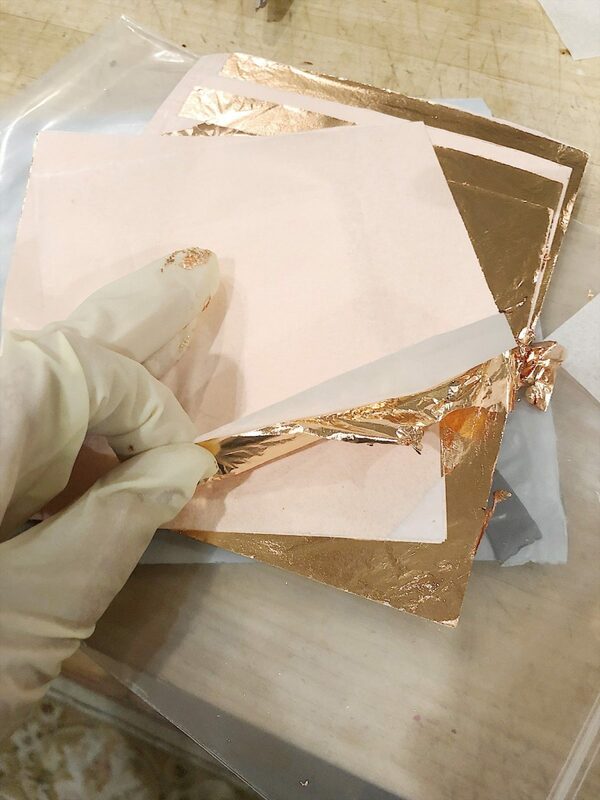 Gently press down on the copper sheets to adhere the metal to the adhesive. I used my fingers (with gloves) and a dry brush to do this. Continue to lay sheets down on any spots that need covering. Don’t hesitate to pull on the sheet and use the leftover metal for another area. Once you have covered as much area as possible use your dry brush to gently remove any excess copper. As you discover small areas that aren’t covered, continue to add more copper. This is the step that surprised me the most. 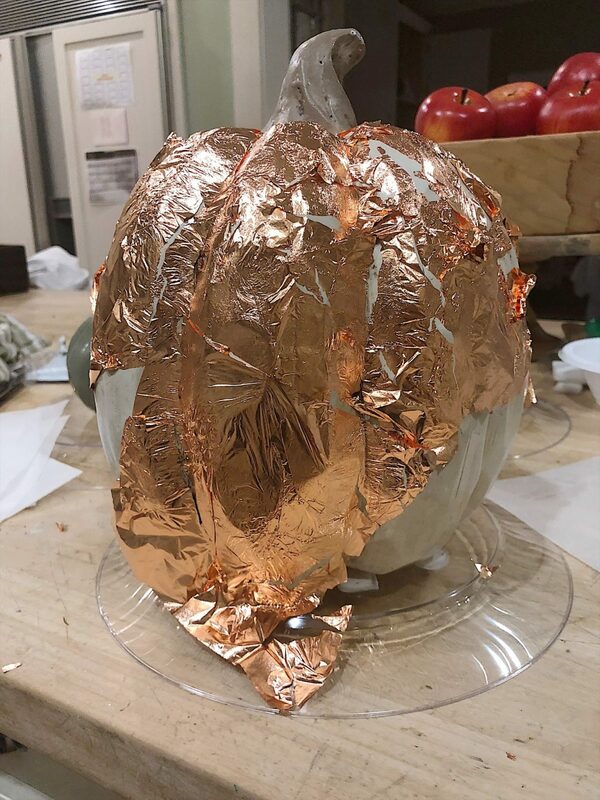 I could add the tiniest scrap of the copper to the pumpkin and it would cover it. And it didn’t leave visible seams or edges. This is when I realized I love this process! At this point, you will discover some areas that need more glue. 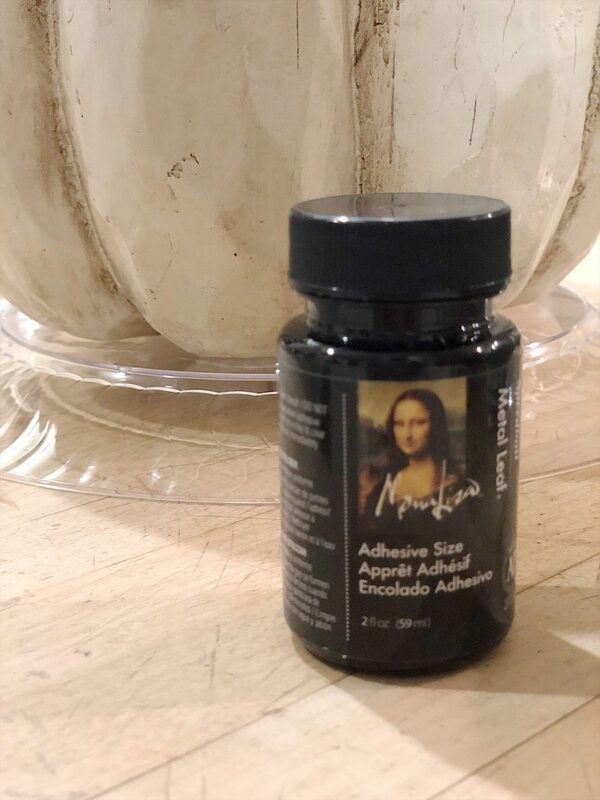 Gently reapply glue to the non-adhesive areas and wait thirty minutes. This was the perfect opportunity for me to start on my next pumpkin. Can I just say at this point I was hooked on pumpkin crafts! My second pumpkin was a lot easier. I had figured out that I didn’t have to be exact and covering a smaller area was a lot simpler to do. Can you believe how these turned out? This is the step where you want to lightly brush on a water-based sealer. My shipment was delayed so I will be doing that later today. 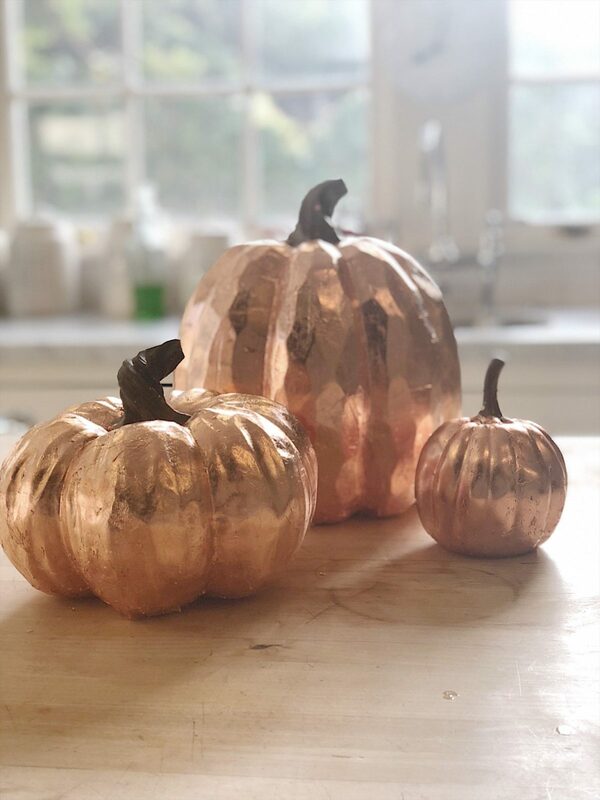 This morning I walked into the kitchen just to make sure my new copper pumpkins looked as good in the light as they did last night. And then my sweet husband said, “Last night I wasn’t sure what you were doing, but today these look great”. 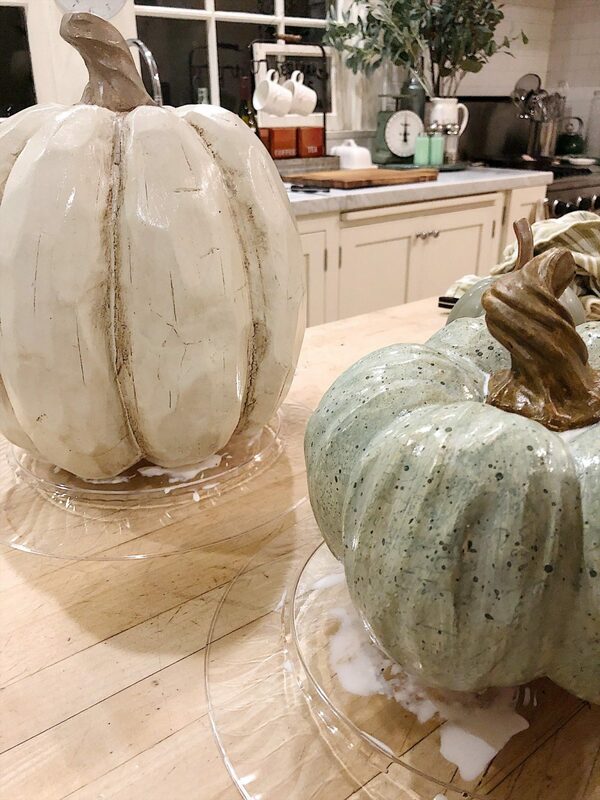 I am still blown away by how easy and inexpensive these pumpkins were to make. I love them and am already thinking of ways to do this again for the Christmas holiday. 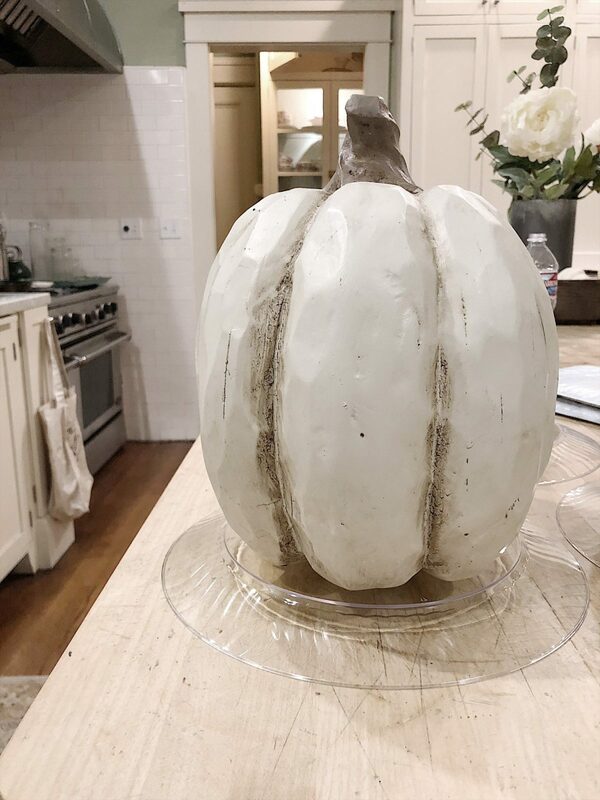 I am so fortunate to be able to share four of my blogging friends that have also created some amazing pumpkin crafts. 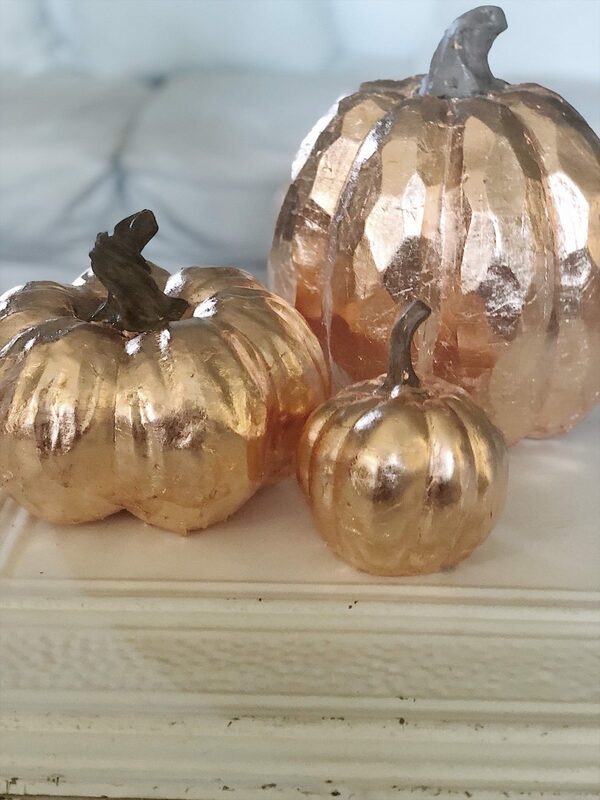 Janine from Happy Happy Nester made the most beautiful Glitter Pumpkins! They are stunning. 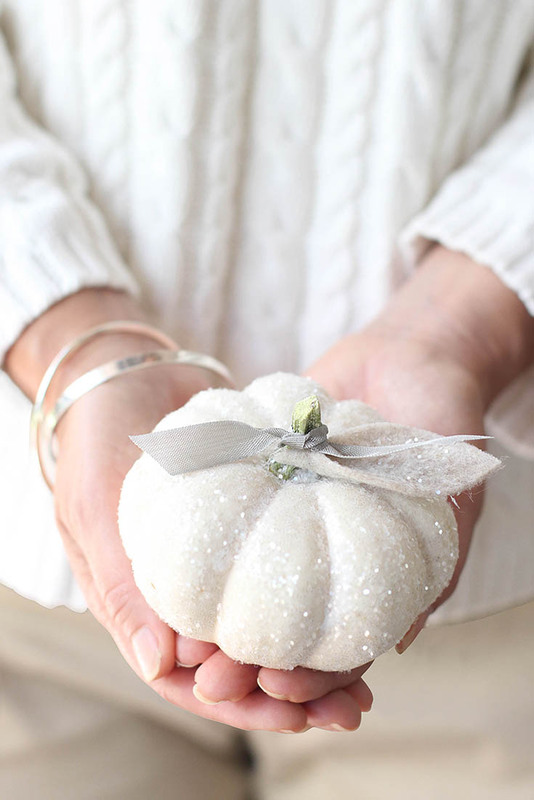 I can’t wait to try this on not only pumpkins but some Christmas decorations. 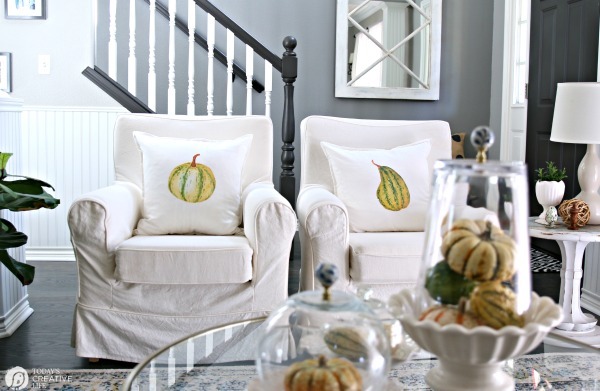 Kim from Today’s Creative Life features DIY Fall Decor as she made these gorgeous pillows! She used my favorite pillow covers from IKEA and she has iron on tutorials on her blog. 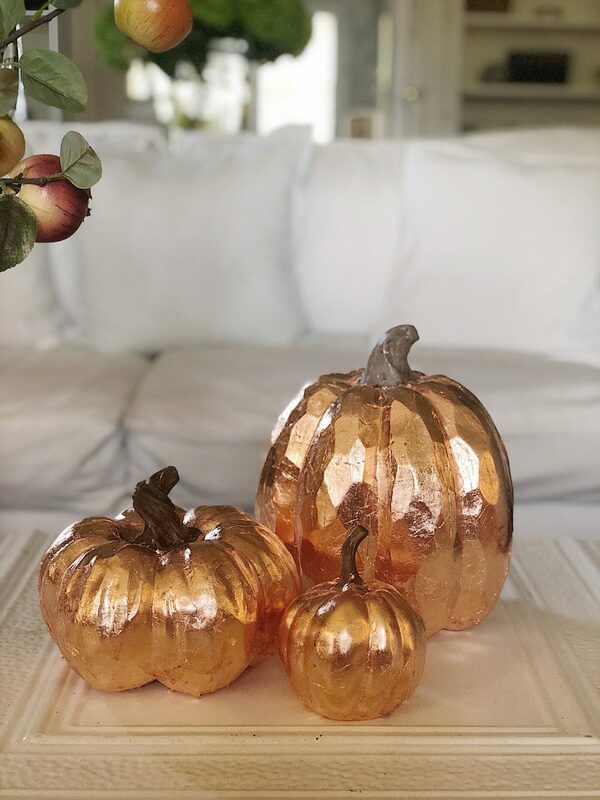 Ashley from Modern Glam made these pumpkin luminaries. I love how they reflect the candlelight. 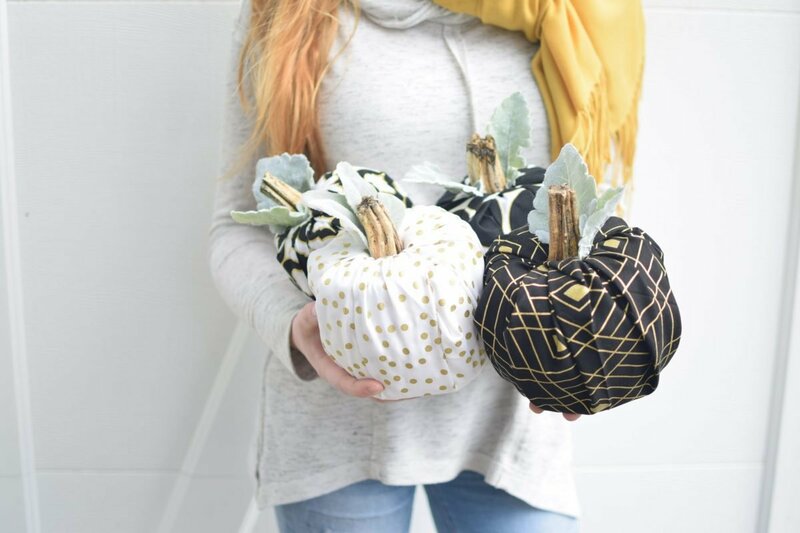 Rhonda from Hallstrom Home made these wonderful Fabric Pumpkins. I love the fabrics she chose. And look at those stems! The ads on your blog are irritating. 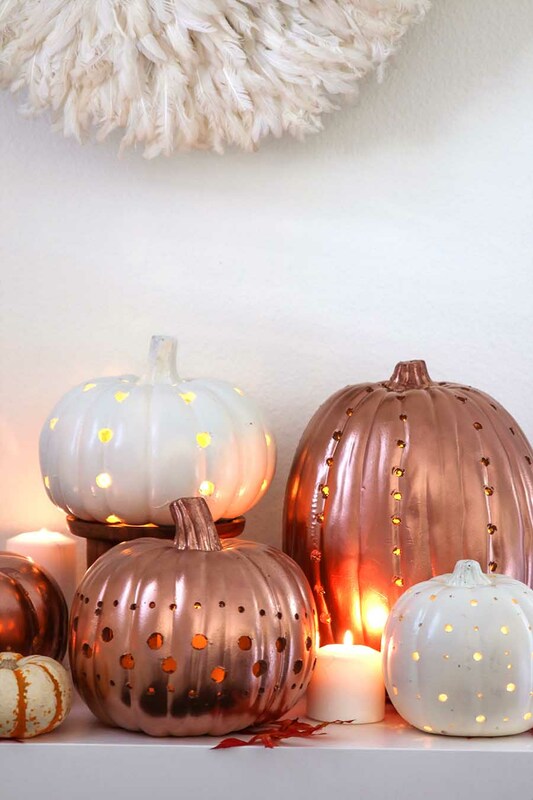 Where did you purchase the faux pumpkins that you used for the copper leafing? Ditto! 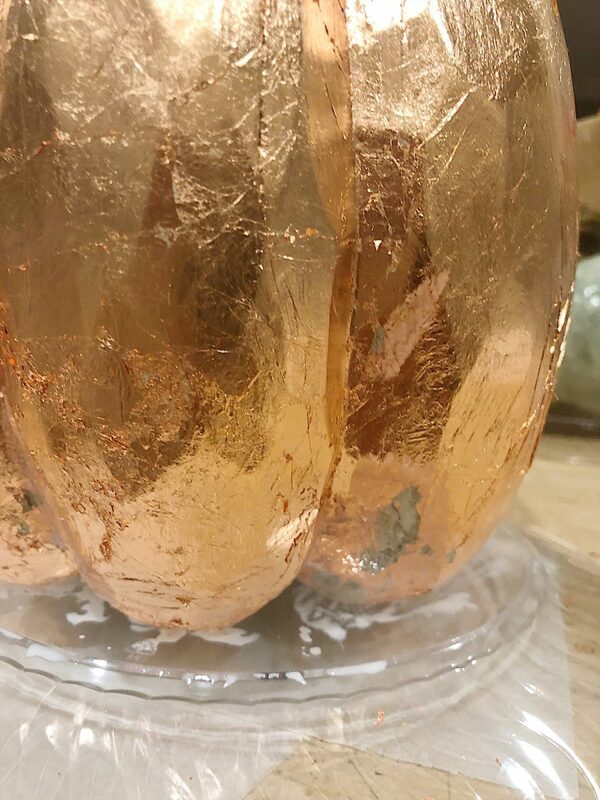 Where did you purchase the faux pumpkins you used for the copper leafing? And did you do anything to the stems?